A table tennis video explaining the forehand drive. 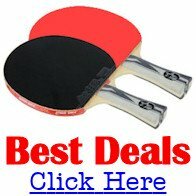 Watching a video in order to learn how to correctly play a table tennis stroke can be easier than reading just text, so I've got a great video here for you. This video shows a demonstration of the forehand drive and explains the technique required to play the stroke. The forehand drive would normally be used when your opponent plays his shot in such a way that the ball approaches you with height and/or depth. The purpose of this stroke is to play aggressively and stop your opponent from playing an attacking stroke, so you should try to make sure that your shot lands close to your opponent's baseline or sideline. To play this stroke, stand close to the table and take a sideways stance facing the line of play. Using a medium stroke, your racket arm should move forward and slightly upwards in the direction that the ball is going to travel, whilst your free arm should point towards the ball to assist with your body turn and balance. During your stroke, your upper body should rotate approx. 45 degrees to the right then turn back to face the ball, whilst your body weight moves from your right foot to your left. The racket angle should be slightly closed to impart topspin. Hit the ball at the top of the bounce (i.e. when the ball it at its highest point) using 50% of your stroke action before hitting the ball and 50% after hitting the ball. Watch this table tennis video featuring Steve Foster.